Flora Duffy (BER) separated herself from the outset and got her request for a “wall of noise” as she steamed through like the human machine that she is, to clinch her second World Title for the first time on home turf. Clearly focused on sealing the deal, when she reached the final leg of the grueling fitness challenge, she said she couldn’t help but break out in a great big smile. 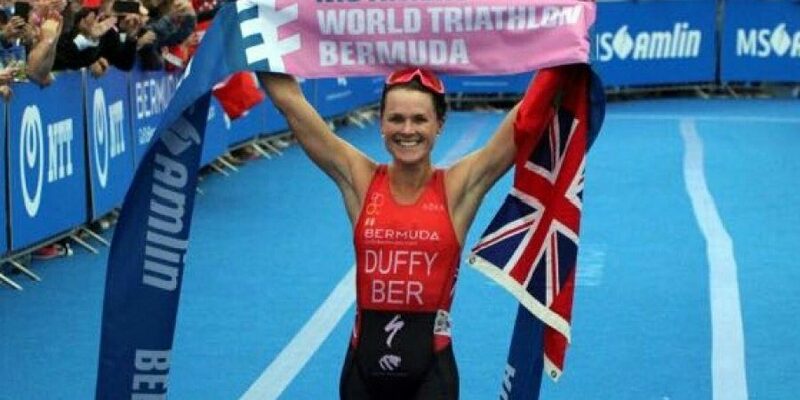 Duffy’s dominating performance to win 2018 MS Amlin World Triathlon Bermuda title in front of thousands of cheering fans on her home turf 96 seconds in the first Olympic-distance race of the season. 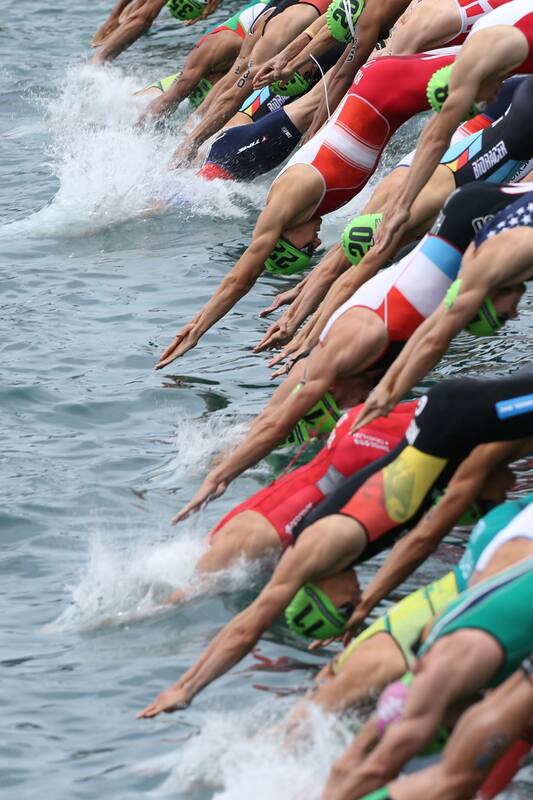 Her two-time World Series also marked another milestone in the international triathlete’s career, as she goes down as the first woman in WTS history to lead in all three disciplines of swim, bike and run. When it was all said and done, Flora Duffy won in a time of 2hr 1min 39sec. 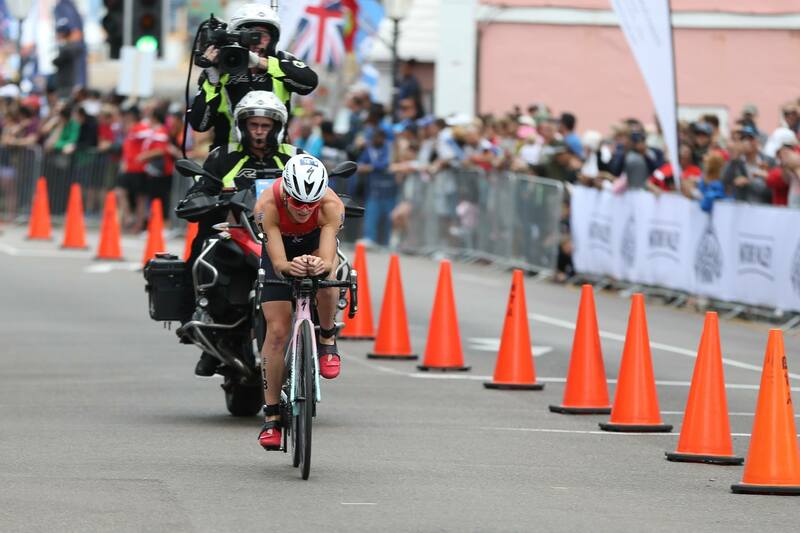 Her win was followed by a close second and third finish by Vicky Holland, of Britain, and American Katie Zaferes. 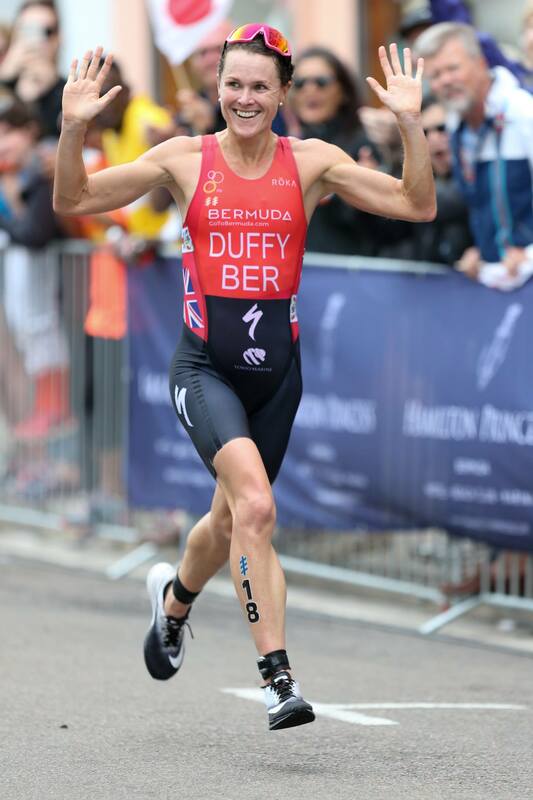 Duffy finished the swim in the lead, with a time of 19:38, completed the bike in 1:06:32 and the run in 34:29. 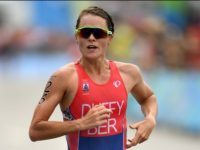 Meanwhile, the big celebration continues with a motorcade through the City of Hamilton on Monday morning, to celebrate Bermuda’s triathlon champion Flora Duffy and her triumphant gold medal win at the Commonwealth Games earlier this month. 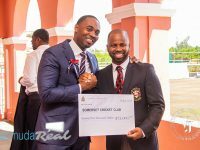 Also travelling in the motorcade will be Clarence “Nicky” Saunders – Bermuda’s first gold medalist at the Commonwealth Games in high jump in 1990. 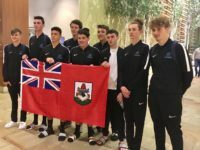 Sports Minister Michael Weeks called on Bermuda’s residents to line the streets of Hamilton to show their support for the two Commonwealth champions. The half-hour parade gets underway at 11:30am at Hamilton Princess and Beach Club and finishes at the Cabinet Office on Front Street. 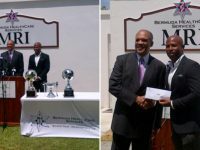 “I am encouraging people to come out and cheer for two of Bermuda’s most outstanding athletes. Both Flora and Nicky have proven to be the best of the best in their sport and are an incredible inspiration to our young athletes,” said Minister Weeks. 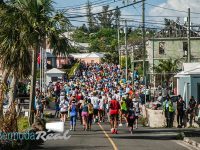 The Bermuda World Triathlon Festival Weekend Hangover Beach Swim event scheduled for this morning [April 29] was cancelled due to weather conditions. Organizers said they were “sorry that the Hangover Beach Swim at Horseshoe Bay is cancelled due to stormy weather approaching”. 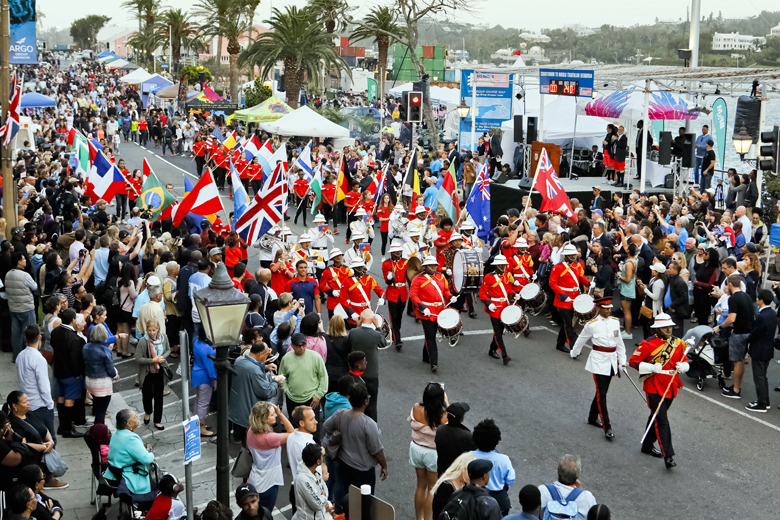 The WTS Festival Weekend started with a colourful Opening Ceremony on Thursday night, [April 26] on Front Street, with children who raced in the TMR Kids duathlon held on Friday. 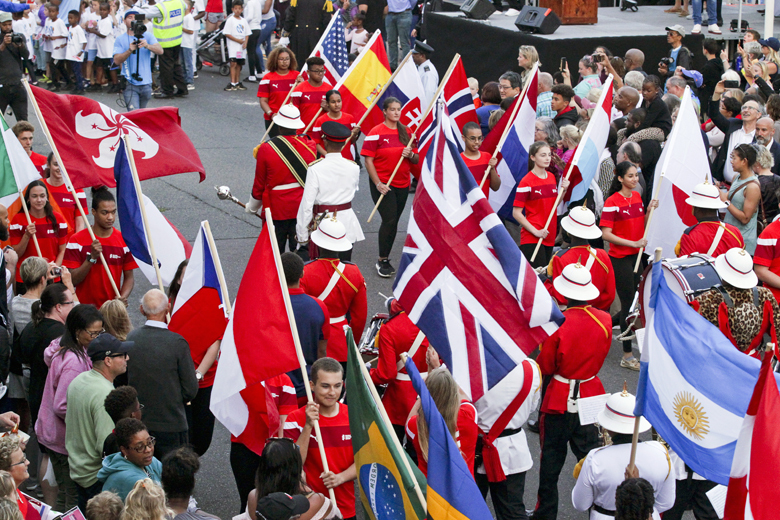 Flag bearers led in a short parade to the Flagpole, followed by Royal Bermuda Regiment band, with the 33 young flag bearers from Bermuda, representing every country competing in the World Triathlon. World champion Flora Duffy was on hand to address the crowd with a host of speakers where she was greeted by a huge crowd to welcome here home. Interviewed live on stage by emcee Nadanja Bailey, Ms Duffy said she was overwhelmed by the opportunity to race in her home country. Minister Weeks described it as an historic event. 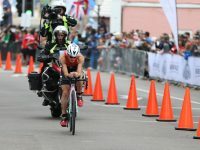 Referring to Bermuda’s World Champion as the queen of the triathlon world, he said: “Rain or shine, no doubt all of Bermuda will be lining the course to give their support to her and all of the participants.” And they did! 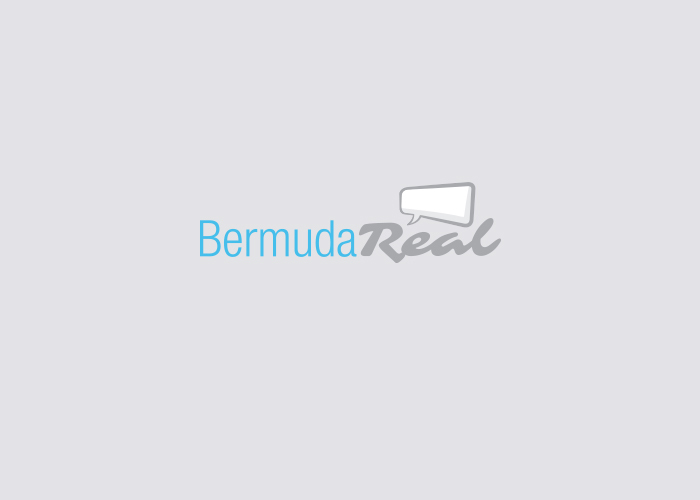 Bermuda Tourism Authority CEO, Kevin Dallas said: “It’s about achievement for Flora and for our athletes. It’s about achievement for our young people. 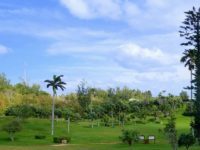 “This weekend is also about Bermuda hosting another world- class event a year after the America’s Cup,” he added. Governor John Rankin said: “This is a wonderful place. A first-class tourism and sporting destination. “Like all of you, I hugely enjoyed watching the Commonwealth Games on the Gold Coast earlier this month, and in particular seeing Flora Duffy win Bermuda’s first gold medal at the games in 20 years. President of the International Triathlon Union, Marisol Casado also thanked the crowd for their support. The celebration continues on Monday.